Amazing hostel - can't wait to return! This hostel is more like a boutique hotel with (very nice) dorms. 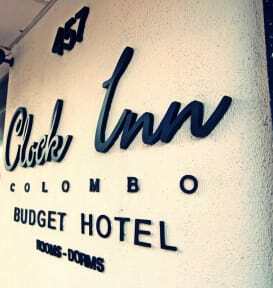 Well-appointed, comfortable, clean, it was among the best I've ever stayed in .when I come back to Colombo, I will head straight to Clock inn colombo! Amazing hostel with amazing people...The hostel was spotlessly clean, staff was welcoming and always ready to help. Would highly recommend this hostel for your stay in Colombo. Very clean and nice place in a good location. Maybe less than 3 km form the city center. Everything within short walking distance best restaurants, Sri Lanka Tea Board, fabric shops, public transport etc. The best part - all staff members were very friendly and helpful. I was staying there almost 1 week because of work. That is so warm and nice atmosphere place. Breakfast is simple but nice.Rooms are clean and comfortable.Clock in located in the city centre and many shops and restaurants over there.Wifi is good. Also, they have a good and helpful staff. Mr Pradeep & Mr Darma & Mr Suba thank you for your assistance. Highly recommend. Loved my stay at the Clock Inn! Was greeted by bubbly staff, a free map and some great information at check in. Rooms and bathrooms were squeaky clean and fortunately I had great company in my dorm room. Breakfast was very hearty and the artsy experiences in the common lounges and stairway are extraordinary! Will be back again soon! There was a half dead cockroach in my room... I told them about it, and they quickly changed the room. Other than that, it was ok for one night. Their interior painting was artistic and cool, but it didn’t have much of a fun social atmosphere. The bathroom could improve more, but the AC worked great and the room was clean. Their free breakfast was a big plus. I would stay again if I come back to Colombo. A BED BUG has bitten me while I was laying on the pillows in front of the reception desk, there was also a dead BED BUG on the wall of the room I was allocated, therefore I requested a room change, so the hostel once could look nice, but due to poor management it became a hellhole, however the staff’s efforts are very appreciated that they struggle with these conditions despite the poor management: DON’T GO THERE! Photos definitely don’t reflect the current state of this Hostel. While the reception/common area is nicely maintained, the dorm rooms are incredibly basic and the communal bathrooms are quite filthy (walls disgusting and toilet/showers tiny) At one point during the night, we awoke to someone on the opposite bunk bed yelling as there was a HUGE COCKROACH crawling across him/his bed. No locks on dorm rooms/front door so didn’t feel that belongings were safe. Definitely wouldn’t stay here again.